Thoughts about Path of Exile's Betrayal League, including difficulty and rewards. A wishlist of features for the upcoming Warframe Fortuna expansion: Integration with the rest of Warframe, dynamic and changing content, rewarding exploration, and improved boss mechanics. A list of the important websites and tools I use to improve my Path of Exile experience. Path of Exile's Delve league is a great addition to the endgame. Interesting rewards and endless difficulty push builds harder than ever. How will Delve be added into the core game? 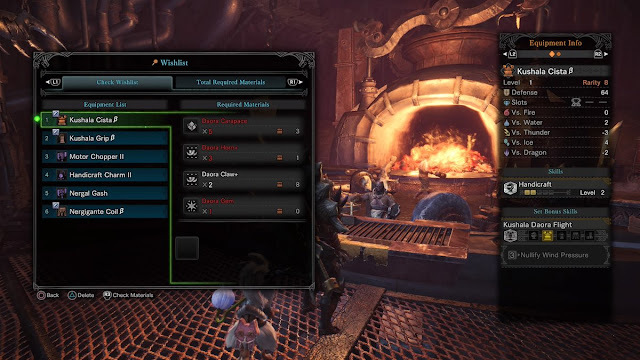 Highlighting some smooth item management features in Monster Hunter: World. Auto-crafting, item loadouts, wishlists, and more. Path of Exile's newest league, Betrayal, launched on December 7th. The Betrayal league adds a new enemy faction called the Immortal Syndicate whose members can be fought and then manipulated by the player. The members can grow in rank and strength adding both risk and reward in a manner somewhat similar to the Nemesis system from Shadow of Mordor. This update has also done away with most of the old Forsaken Masters, as they have joined the Syndicate as enemies. Zana remains the master for maps and the Atlas. NPCs from recent leagues have replaced them, with Alva, Einhar, and Niko bringing Incursion, Delve, and Bestiary to the core game. New NPC Jun is your ally against the Syndicate in addition to revealing new "veiled" item mods. 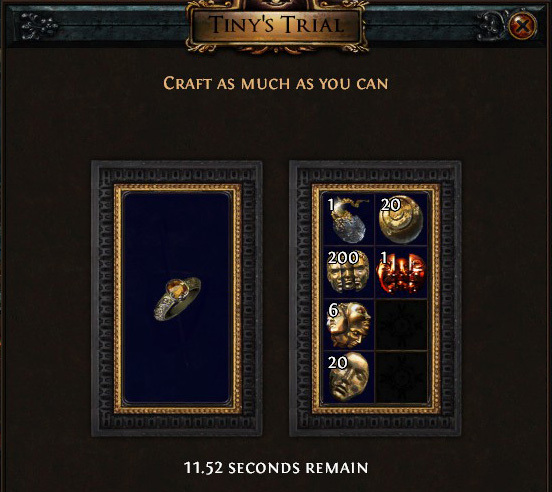 More important, the reputation grind from the old masters has been removed and the master crafting mods have been consolidated into one single crafting bench. Some crafted mods are now unlocked throughout the story, in endgame areas, or in special locations like the Incursion temples, Delve depths, or even Prophecy chains. Hideouts have also been reimagined, persisting across leagues and starting at full-size. Many new hideouts have been added, including ones that must be found and unlocked, some even rarely appearing in certain maps. Hideout templates can be exported/imported and shared with other players. I will now finally be putting some effort into my hideout now that it won't disappear after the league is over. I decided to start the league with an Arc mine Saboteur. I had never played a mine build before, but I have used Arc before (an Arc totem Hierophant in Incursion league). I was thinking about switching in Glacial Cascade for certain bosses but the character ended up doing well enough with Arc. I was unsure if I would enjoy the mine playstyle but after the initial learning curve, I am actually having a lot of fun with the character. The Saboteur ascendancy nodes and the instant mine detonation from the skill tree end up making combat surprisingly smooth. I also feel reasonably safe with a combination of the Saboteur's blind node, Mind over Matter, Acrobatics/Phase Acrobatics, Enfeeble, a decent life pool, and a Loreweave. So far I have cleared the Atlas, defeated the Betrayal Mastermind, Atziri and Uber Atziri, Ahuatotli and Kurgal, Shaper, Elder, and Uber Elder and just finished 36/40 challenges. My first red Elder dropped a good Watcher's Eye and an Impresence which was a nice boost. I put most of my early currency into a 6L Loreweave, an Essence Worm, and a +1 mine helmet. After some other gear upgrades, my character was in a good enough state to reliably clear all the content I was interested in doing (everything but very deep delves), so I started saving currency. I ended up buying a Headhunter (my first ever) for 64 exalts for a potential new build, or alternatively just to have one. I'm glad I chose a powerful build with multiple defensive layers, as the new Immortal Syndicate can be extremely dangerous at times. Certain members, like It That Fled or Tora, can be particularly deadly when they are rank 3, with multiple powerful items, damage-boosting map mods, and support from other Syndicate members and masses of spawned enemies (including rare enemies with auras). I actually think that the Syndicate is mostly balanced for the bulk of the game. There are some large difficulty spikes during leveling and in high-tier maps, and with certain members, but overall I appreciated the challenge level. A patch has since reduced some of the danger by reducing damage and monster spawns, improving skill visibility, and cleaning up some of the visual clutter. Some of the difficulty remains only with less "unfair" spikes or offscreen/unseen attacks. I think my one complaint about the difficulty is actually something that is not (yet?) being addressed and would require a more systemic change. To me, it feels strange that the Syndicate members are at their most dangerous in maps and at their weakest in their own safehouse. Since the safehouses have no map mods, even the highest level safehouses feel trivial compared to any random encounter in an average map. This all seems a bit reversed to me, but I don't know if there's an easy solution. Giving the safehouses some map-like modifiers (similar to Delve?) would be an interesting start. Perhaps the mods could be based on which members are in that safehouse. For example, Vagan could increase the crit chance of other members or Haku could add physical damage reduction. More simply, maybe the members could just be made stronger when inside a safehouse. Betrayal's rewards are in a similar place to the difficulty, I think. The majority of the new rewards are powerful, novel, or entertaining. The new map-affecting scarabs from the Intervention branch are a great new mapping tool. Items from old leagues like Talisman, Bestiary, Harbinger are available, and Breach got an incredibly effective upgrade option for breachstones. There are new ways to craft items such as increasing quality above the 20% cap, adding veiled mods, or even a free "exalted orb" to use on an item. 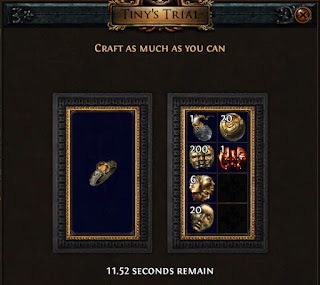 But my favorite new rewards are probably Guff's "Tiny's Trial," a timed crafting spree with often amusing results, and "Trapped Stashes" which give you a few seconds to grab one item (unidentified uniques, divination cards, currency, rare items, etc.). These two prizes manage to reward experienced players with crafting and item knowledge while simultaneously teaching newer players the same. These are not always the most rewarding options but they are some of the most creative. My only issues with the Betrayal rewards are that a few of the members just have incredibly underwhelming rewards and that there is not enough incentive to fight high-level Syndicate members over farm easier fights. Vagan, for example, gives various rare items in each branch. As far as I can tell there is absolutely nothing special about the items; they are simply random rares that you can get by the dozens anywhere else in the game. Other members like Aisling or Hillock are useful only for specialized crafting purposes. Of course, there will always be some rewards that are just better than others, I'd just like to see the gap closed a little bit more. The other problem seems worse to me, especially because it is essentially the same problem the developers worked on fixing with Delve's Quarry Sulphite farming (the Quarry was used similary for Incursion farming too!). If you can farm up Syndicate intelligence in an easy zone, with greatly reduced danger (an even bigger issue before the balance patch), and get mostly the same safehouse rewards, the system loses meaningful progression. I have conflicting thoughts on the Mastermind fight. The fight is well-designed (despite needing some improved audio/visual cues for certain mechanics) and can be challenging at high levels. Your reward for completing the fight is one Mastermind unique and a few veiled rare items. The Mastermind uniques are creative, potentially useful, and unfortunately not very valuable. The veiled rare items are unlikely to be good. Perhaps the most important reward is unlocking unique veiled mods, such as on the Cinderswallow Urn unique flask. But once those mods are unlocked, that's it. On top of that, completing the fight resets the entire Syndicate, which is understandable but also somewhat frustrating when the fight can easily be less rewarding than the individual safehouses. I don't imagine it will be uncommon for some players to just ignore the Mastermind entirely after the first few successful attempts or once a desired veiled mod is found. I definitely think the Mastermind fight could use some additional rewards. Maybe the rewards from the four about-to-be-removed safehouse leaders could show up after the battle. While I was writing this post, a patch was released improving the Mastermind fight including the rewards and signaling of mechanics. The Mastermind arena now has treasure rooms with the rewards from each of the four safehouse leaders. Although this is a good addition, I still think more needs to be done. 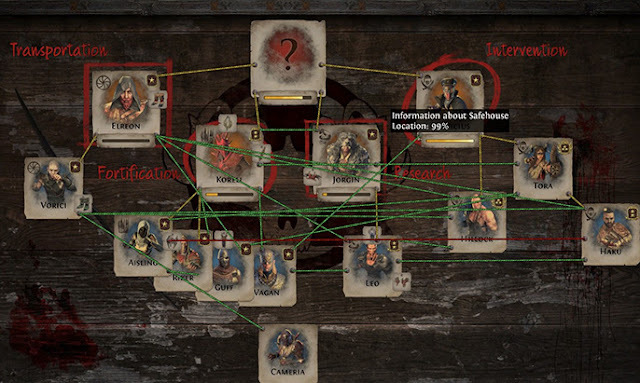 Trading your entire Syndicate chart, potentially with hours of setup and progress, for four safehouse rewards is still not a great choice. I imagine Betrayal will make it into core Path of Exile in some way, especially since scarabs have already been added to the Fragment stash tab. With all the work that went into creating the many new characters (and updating the old masters), it would be a shame not to see them again. The same goes for the new rewards like scarabs and the special crafting benches. Obviously having the Syndicate in its current state would be too disruptive, so the usual method of reducing the spawn rates might be all that is needed. Perhaps the intelligence gains might need to be adjusted so that the Mastermind fight is still reasonably reachable. Other than continuing balance changes, I'm not sure much else would need to be done. Warframe's newest expansion, Fortuna, is (hopefully) just around the corner. 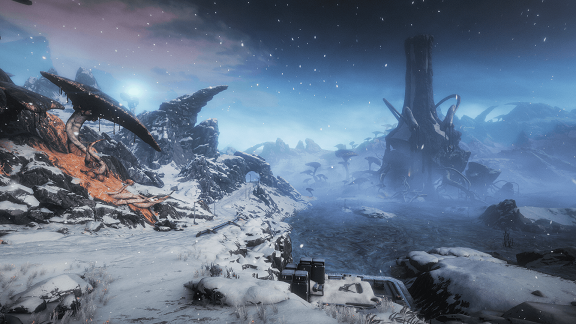 Like Plains of Eidolon before it, Fortuna is adding a new open-world area, the Orb Vallis on Venus. I started playing Warframe right around the release of Plains of Eidolon in November 2017 and I'm excited to explore a new open world at launch one year later. Since I was new to Warframe last year, I didn't really get to dive into the plains right away. I still haven't finished all the Amps and Zaws, but I have captured a fair number of eidolons and caught a lot of fish. Plains of Eidolon, as the first open-world area in Warframe, was not without its problems. The grind for resources and standing with the factions in Cetus (the Plains' town) was over-the-top even in a game built around grinding. Bounties, multi-stage quests, only gave out one single reward at the end of the chain, before later being changed to award items at each stage. Some players struggled with performance in the Plains and Cetus, and the door leading out into the plains would often fail to work properly. The Plains are still getting changes even now, with some important fixes coming over from Fortuna. The Archwing launcher is now infinite. The mechanic for mining will be improved. Bounties may soon be taken while outside instead of having to constantly return to Cetus. It certainly looks like Digital Extremes has been taking feedback and lessons from Plains of Eidolon into account for Fortuna. On developer streams and in interviews they have mentioned wanting to avoid the grind (to an extent) that troubled the Plains of Eidolon launch. The ability to take bounties without returning to town was often requested and will be in Fortuna. Even the new K-Drive hoverboards seem like a great response to players doing whatever they can to traverse the open-world quickly (Archwing, Nova portals, Zephyr flight, Volt speed, Void dashes, etc.). There are some other things I'd like to see in Fortuna, whether at launch or in later updates. I think my biggest issue with Plains of Eidolon is how self-contained and separate from the rest of Warframe it feels. Almost all of the new resources, including fish and ore/gems from mining, are used solely for new Plains of Eidolon items like Zaws, Amps, and occasional normal weapons. What I loved in the rest of Warframe's star chart is that I was always gathering resources that I may need down the road. If I find an Orokin Cell on Ceres or an Argon Crystal in the Void, I can use those to craft numerous items from varied sources. In the Plains, there comes a point where I no longer need Cetus Wisps, Grokdrul, Norg Brains, or Coprite Alloy. At the moment, it doesn't look like I will ever need more Grokdrul to craft a weapon from some new quest or new content. I will always need the "standard" resources from elsewhere in Warframe. This actually makes the Plains somewhat of a waste of time for new players who need those normal resources, but the Plains are new and shiny and on the starting planet of Earth so those same new players might end up there anyway. Separately, the Plains are not involved in many of Warframe's other content mechanics. There are no Plains alerts or invasions (ghouls aside) or void fissures or syndicate missions. I can count the number of times I've seen a Plains Sortie on one hand, and they don't even work very well. The only special events for the Plains are the recurring Ghoul Purge and the occasional Operation: Plague Star. I hope that Fortuna is a little better in this regard. Obviously, there will be new Fortuna-only resources and items to build with those resources. I just want Fortuna to remain relevant to the rest of the game beyond that. I would love to see an alert that takes you into a Corpus base on Orb Vallis, or an Invasion to aide the Solaris United against the Corpus, or a full Sortie that takes you across the Venus landscape. On the crazier side, since we know there will be K-Drive races, there could even be race events! Somewhat similar to the above points, the Plains of Eidolon feel very static. 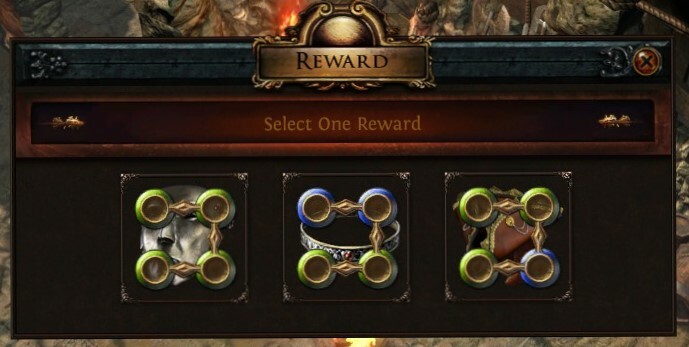 Bounties rotate in rewards but always consist of the same few events in the same few locations in a different order. Grineer bases and camps across the Plains are just a few turrets with a few enemies and don't really "do" anything. Nothing accomplished in bounties or quests has any substantial impact on the world. Fortuna does seem to have improvements on this front, though. In a Fortuna Preview video by MCGamerCZ, we learn that Fortuna bounties will have greater variety, including missions not tied to a single area and random bonus objectives for additional rewards. We haven't seen too much of the Corpus bases, but I have a feeling they may contain more than just enemies to kill, and some of the bases can even be captured. What I really want to see is the ability to progress the storyline for Fortuna forward in some way. Plains of Eidolon has a few quests that resolve a few questions or situations, but there isn't much forward progress for the NPCs or the town of Cetus; it's more of a holding pattern. Since Fortuna has a clear villain (Nef Anyo and his Taxmen), a clear problem (debt enslavement of the Solaris), and a faction to ally with (the Solaris United resistance), I think it would only make sense to be able to work towards the goal of defeating Nef Anyo and freeing the Solaris. Clearly, this couldn't be a full victory or the new open world would no longer make sense, but I would like to see changes in the environments, the dialog, the NPCs, etc. Maybe we could rescue a new merchant, fortify a resistance base, or earn assistance for a boss encounter. Plains of Eidolon is a beautiful environment with a lot of ground to cover and locations to explore. Unfortunately, there isn't much to find, aside from a few hidden lore items. There are a number of caves to explore, and even an achievement for exploring all of them, but nothing to be found aside from mining locations and some of those lore items. The same goes for the Grineer bases, which only exist to serve as bounty targets and enemy hotspots. There are no hidden caches (aside from those in a bounty), hidden items like Ayatan sculptures, or random scannable items like Somachord Fragments. There is essentially no reason at all to stray from the direct path between objectives. Again, I have hopes that the large Corpus bases and expanded caves in Fortuna will have some impact here. The K-Drive may actually help as well, making exploration more entertaining as well as more rewarding as K-Drive tricks give standing with the Ventkids. Anything that rewards exploration in Fortuna will be a great improvement for me. The assumed equivalent to the Eidolons of the Plains will be large spider-like "Orb Mothers," though they won't be available at launch. I have had a lot of fun fighting the three different Eidolon bosses, but I don't like how restrictive the fights are. A large majority of Warframe abilities flat-out do not work against the Eidolons, certain Amps are objectively better for the fight, and the only weapons that really work for the fight are snipers. This leaves the Eidolon "meta" with only a handful of frames (Chroma, Rhino, Harrow, Volt, Oberon, and Trinity, with a few other occasional substitutes), two useful Focus schools (Madurai and Unairu), essentially one Amp component (Shraksun Scaffold), and a few sniper rifles (Lanka and Rubico, mostly). Warframe is all about choice and customization and variety, and Eidolons restrict most of that. I imagine the new bosses will continue the pattern of using both Operators and Warframes for different phases or targets, which I am fine with. I just don't want the bosses to arbitrarily lock out entire classes of Warframes or weapons. A "caster" Warframe should be able to meaningfully contribute, as should a shotgun, a beam weapon, or even a melee weapon (melee "Amps?"). Perhaps this is because the Eidolons must be fought in sequence in a single night, which means equipment and Warframes cannot be changed out for each boss. I think it might be an effective change if Fortuna's bosses were independent of each other. Having three (or more) Orb Mothers which require different tactics and can be fought at different times and offer different rewards would open up so much more space for players (and the developers) to experiment with different combat strategies. One boss could be a very close-quarters experience while another keeps players at range, one boss could be vulnerable to abilities while another is vulnerable to weapons, etc. Alternatively, allow arsenal changes out in the open world (at captured bases, for example)? Path of Exile's newest league, Delve, launched about 2 months ago, adding an "infinite" dungeon to explore, loot, and progress through. Some early problems with Delve mechanics like flares, character bound progress, and Sulphite costs have since been addressed. For me, Delve is now mostly in a good state. The Azurite Mine itself is a great alternative endgame activity that breaks up endless mapping. Each individual Delve route or exploration out into the darkness can be rewarding, the new fossils and resonators are powerful for crafting, and progressing lower into the mine brings increasing rewards (to a point). Getting down to level 270, where the level (83) is equivalent to the highest, tier 16 maps, can be a bit of a slog at first, but gaining access to "free" tier 16 loot is well worth it. Certain special nodes, like currency, are great the whole way through the mine, but once you get low enough, almost every node can spit out valuable items. 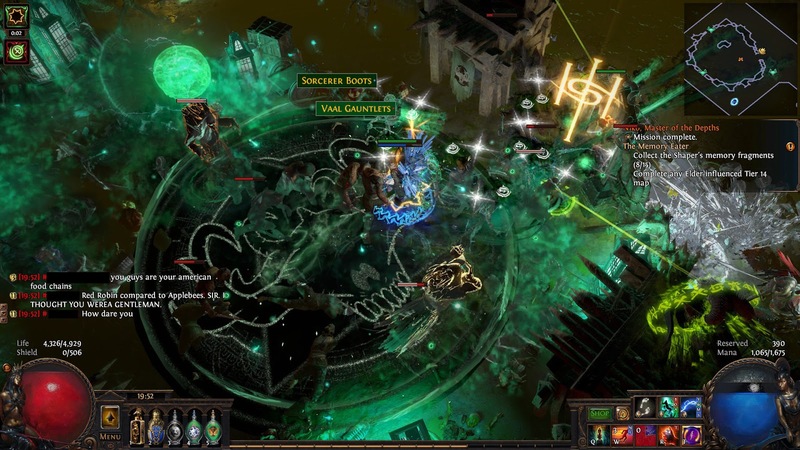 Tier 16 maps, high level Shaper or Elder gear (including jewelry), divination cards, prophecies, special Delve mods on items, and previous league content are all available. I love that Delve, like Incursion before it, is really taking advantage of Path of Exile's extensive league history. The addition of previous content that may not normally be easily accessible is a great way to keep the Delve loot exciting. Talismans and Bestiary "Aspect" items are back, Harbinger currency and Essences and Prophecies can drop from certain chests or nodes, specific fossils can give Abyss sockets or corrupted Essence mods, and even Warbands make an appearance. I'm still waiting for more usage of Tempest, though. While revisiting old content in this way is a good choice, Delve's most important addition is probably the endless difficulty scaling. The challenge in Path of Exile has always had a ceiling: clearing the Atlas, killing an endgame boss like Uber Elder, etc. After leveling and gearing your character and completing a certain challenge, you were essentially done. Top end, extremely expensive gear upgrades were fun to look for but rarely required. Increasing your effective health or DPS by 1% wouldn't really change anything. But with Delve, if you want to push deeper and deeper, your character now needs every possible upgrade. That specific best in slot item tailored to your build might now be worth pursuing, and with Delve there are more tools than ever to find or create these niche items: fossil crafting for unique Delve mods, Abyss sockets and jewels, corrupted implicit mods, and more. If you go deep enough, you may need to start looking at nontraditional defenses or crowd control like frost walls, knockback, or chance to flee. 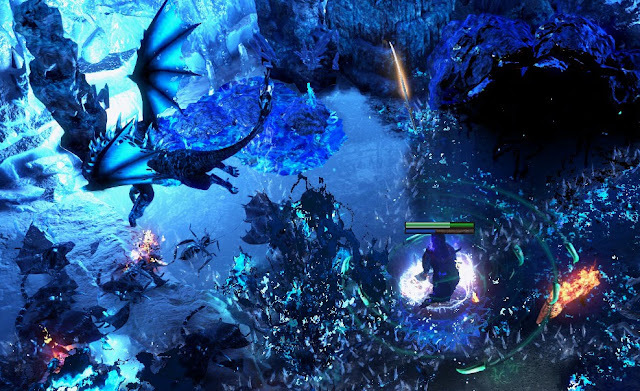 Similarly, Delve has incentivized coordinated group play more than ever. Group play has been rewarding, but a fully optimized party setup was a bonus, not a necessity. In Delve, setting up your group to cover all the requirements for pushing deep can get very complex. 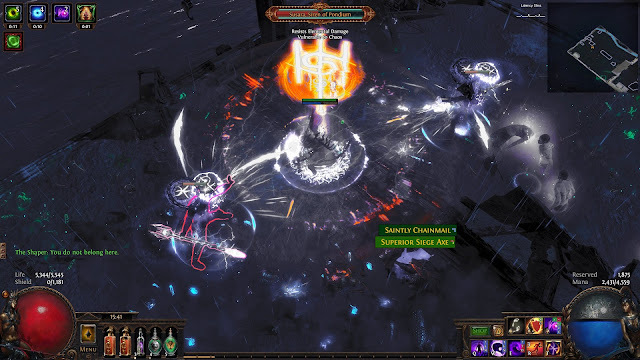 For example, the first group to reach Delve level 1500 (and later 3000) had "standard" aura and curse supports but also a "Shock Spider" support adding shock, intimidate, and Aspect of the Spider. Empyrian, the "Shock Spider" in that group, appeared on (Path of Exile podcast) Baeclast #28 and went into further detail about the group's strategies, character setups, and experiences at very deep depths. The only aspect of Delve that I still dislike after multiple patches is the extremely stingy spawn rates of the Delve bosses (and less importantly, the rare fossil rooms). I reached delve level 400 and saw only two bosses, both of which were the same, lowest level boss Ahuatotli. The boss was unique and fun to fight. I can only guess that the other two bosses are the same because I never saw even one. There are even challenges for each boss requiring specific kill conditions so in some cases you will have to fight the boss multiple times. In fact, my second Ahuatotli boss kill felt like a complete waste because I mistakenly failed the challenge requirements I was attempting. Additionally, since Delve mods affect the bosses, your rare boss spawn might be near impossible for your build if it happens to spawn in a certain zone. Delving deeper also appears to increase the spawn rates for bosses but can also increase their difficulty dramatically. It's hard to judge when it might be more effective to travel sideways instead of downwards. The boss spawn rates are frustrating because this is not a new problem. The same problem occurred with the Chaos Warband, Chayula in Breach, Abyss liches, and legendary Bestiary beasts. In each case, the spawn rates were eventually improved. I now see more Abyss liches than I ever saw in Abyss, for example. I don't understand why there is always a fear of letting more players actually see and engage with new, interesting content. The Delve bosses are so rare that you cannot even gain much experience fighting them in preparation for completing the challenges. A recent patch, a little over a month into the league, did increase the "spawn chances of all Delve bosses." By how much, I'm not sure, but this change is, of course, better than nothing. But I'm not sure just tweaking the numbers is the best improvement. I would prefer to see the Delve bosses spawn more often but with proportionally lower drop rates for their unique items. I would rather see each Delve city give some sort of incremental progress towards the related boss (like Breach splinters). I would like some method for influencing or encouraging specific Delve bosses to spawn. Izaro, Atziri, Uber Atziri, Shaper, Elder, and Uber Elder are all accessible to players in a straightforward way. Spend fragments or offerings or maps and fight the boss. There is always some forward progression as you gather the required items or manipulate the Shaper and Elder on the atlas. In Delve, there is a sense of progress in the mine, but not towards the bosses. Any node in any direction may reveal a boss, or it may not. Delve in the Core Game? 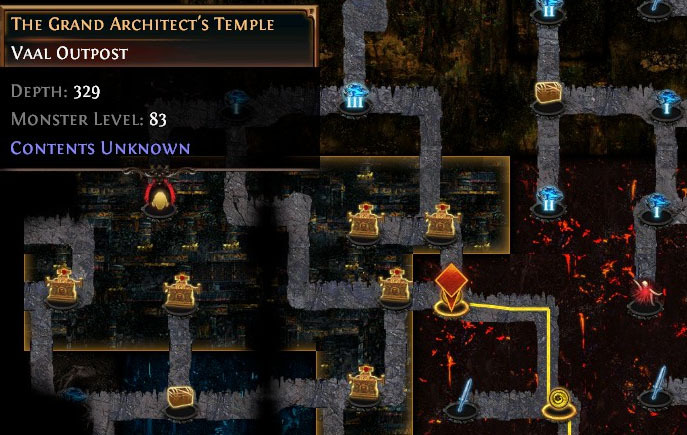 Assuming Delve makes it to the core game (and I am almost certain it will), I hope that new nodes and other content are periodically added. I am also unsure how exactly Delve will be integrated. If it remains in its current state as a supplement to maps, the rewards or accessibility may have to be reduced. But if these reductions go too far, will it still be worth delving? On the other hand, if Delve becomes some sort of alternative endgame, in place of maps instead of alongside maps, the entire progression would have to be reworked. Maps have always required investment: the maps themselves, currency for rolling the maps, additional resources like sextants, prophecies, and Vaal fragments, Zana levels and mods, and Atlas setup and strategy (Elder/Shaper influence, shaped maps, etc.). Since Delve is currently tied directly to maps via sulphite, your investment in maps creates (delayed) returns in Delve. If Delve becomes a separate progression, it would need to have its own costs to not invalidate map progression. I'm not sure how that would work and this path seems unlikely regardless. No matter how Delve ends up being added to core Path of Exile, it will probably end up being a substantial addition to the game. Delve may not end up in the best state immediately, but I think it could become one of the endgame pillars just as maps are now. Mapping has gone through numerous revisions, including the Atlas of Worlds and then War for the Atlas, so I hope Delve will be similarly improved as needed. I'd love to see new fossils, new rooms, new encounters, new tilesets, or new Azurite purchases. There is too much potential for Delve to just be added with some lower accessibility and then forgotten. Aside from Delve itself, I was impressed by some of the other important changes in this league. The new loot filter options for beams and map icons are great, especially for players who play without sound (by choice or otherwise). Custom drop sounds offer endless personalization and more community involvement. On the gameplay side, the new Zana missions are a huge improvement. Zana offering appropriately leveled maps with potentially good rolls and new, interesting, rewarding mission types makes her missions much less of a chore. Zana's new map mods like rerolling within a tier and "shaping" a map 5 levels higher make filling out the Atlas much less frustrating (even more so in SSF). Zana even hands out some early maps of your choosing as you progress through her Atlas questline. If the rumored upcoming "master rework" league/expansion improve all the masters similarly, I will be relieved. The masters were a substantial and important addition to the game but have mostly been left to grow stale and unenjoyable. Finally, the new Shaper Strongholds are yet another bonus encouraging Atlas completion instead of single shaped map strategies. The more of this, the better, as I enjoy completing the entire Atlas each league. The Stronghold spawning mechanics could probably be less obtuse, though. Despite some of my issues with Delve, I think it is my favorite league yet. Having something else to do beyond mapping was very refreshing. I hope that when Delve is added to the core game that it remains just as engaging. In the end, I reached Delve level 400, killed Uber Elder a few times (video below) and completed 36/40 challenges (my usual goal and stopping point). I used a somewhat unimaginative but powerful Triple Herald Blade Vortex Elementalist with Inpulsa's which worked pretty well in Delve, to a point. My character can be seen here. The scaling AoE clear and ability to deal damage in motion combined for mostly smooth delving. I found only one Timeworn Reliquary Key, used it, and received Esh's Visage, Soul Catcher, and Mutewind Whispersteps. Selling the key would have been better, but so much more boring. Monster Hunter: World is the first Monster Hunter game I have ever played, and I enjoyed the game from beginning to end (and beyond). 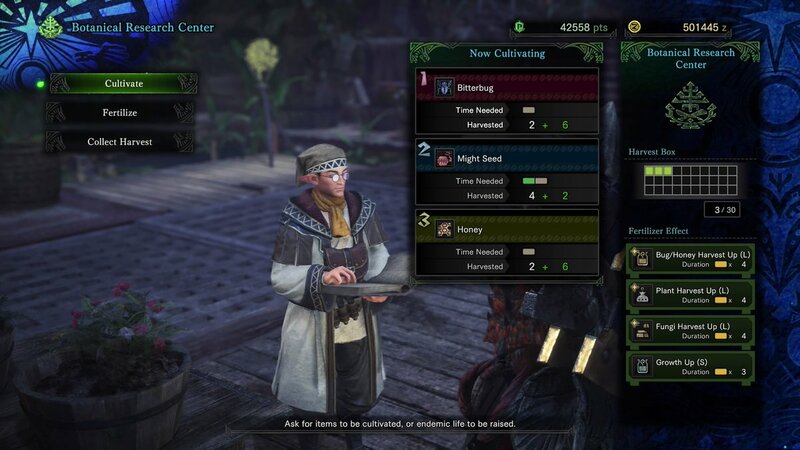 I spent over 150 hours hunting monsters, crafting new gear, and completing every quest available. The combat has weight, the weapons are all viable and unique, and the monsters have wonderful animations and personality. It is now easy for me to understand why the Monster Hunter series can be so rewarding. Although I loved the core gameplay, I really appreciated some of the less glamorous features that made the monster hunting loop so much smoother. In particular, a number of systems for item management made handling the dozens of plants, insects, materials, monster components, and gear much less tedious than I was expecting. I'd like to highlight some of these features below. Monster Hunter: World has pages and pages of items you can craft, from standard healing items to traps, bombs, and ammo. Many of the ingredients you gather out in the world exist only to be crafted. Herbs become Potions, Flashbugs become Flash Pods, Blastnuts become Sticky Ammo. Thankfully, Monster Hunter: World allows you to toggle "auto-crafting" on for these items and others. In the picture below, I have it set up so any Herbs I pick up will be automatically crafted into Potions, if I do not already have the maximum 10 potions in my inventory. Similarly, my Potions will be automatically combined with any gathered Honey to create Mega Potions (again subject to capacity). I have similar auto-crafts set up for Antidotes and Herbal Medicine (Antidote + Blue Mushroom), and other items not pictured (like Flash Pods and Dung Pods) on additional pages. I cannot imagine how the game would feel if, while out of potions in the middle of a fight, I had to grab an herb, open the menu, select the crafting menu, craft a potion, close the menu, drink a potion, and continue fighting. 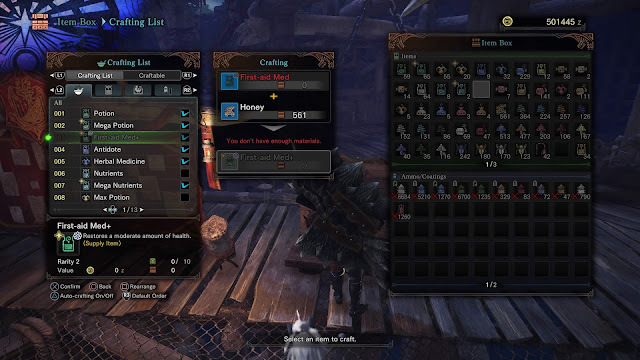 Even without the pressure of combat, it feels nice to be able to craft items without stopping while searching for a monster or chasing one down. 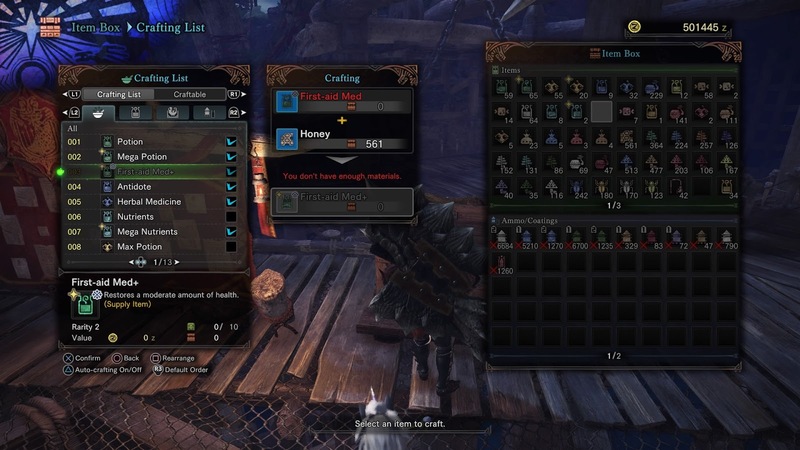 As mentioned above, many items in Monster Hunter: World are crafted out of other crafted items. For example, a Mega Armorskin is created by combining an Armorskin and a Nourishing Extract. An Armorskin is a Catalyst and an Adamant Seed. A Catalyst is a Bitterbug plus Honey. These types of nested crafting recipes can be a mess as you try to work back through the components seeing what you need to create. In the video below, you can see how Monster Hunter: World allows you to easily handle these multi-step crafting recipes. As an example, I try to craft an Ancient Potion, which requires Immunizers that I do not have. Upon trying to begin the craft, a window automatically pops up allowing me to craft Immunizers. Again, I am missing a Catalyst required to make the Immunizer, so once again a window pops up to craft that item. I can then craft my way through the components in reverse order until I end up back at the Ancient Potions. There is no switching back and forth between recipes, trying to remember what you need to craft. If I want to craft an item, no matter how many subcomponents are required, I can always craft that item in one continuous action, as long as I have all the base ingredients. Since I am often carrying upgraded potions, elixirs, and tools into combat in the endgame, being able to craft the highest tier items easily is very helpful. Due to the substantial variation in monster weaknesses and behavior, gear, and even objectives (kill vs. capture), it is often advantageous to change up what you take into the field. Monster Hunter: World has easily customizable loadouts for both items and equipped gear to make these frequent switches easier. Here you can see some quick item and gear loadouts I made. The process is as simple as setting up the items once and then registering that loadout. After that, you can always instantly switch to that loadout (with missing items ignored). I even use my generic item loadout to quickly dump items I've gathered in the field back into my item box; by choosing that loadout, all extra items are sent to my box, leaving me with my standard items and a cleaner inventory. Gear loadouts work the same way, although I didn't use them as much until the endgame. 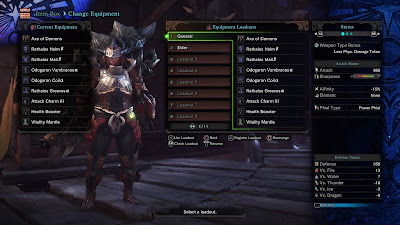 Eventually, I ended up making a specific loadout for each elder dragon, changing up my armor or equipped decorations accordingly. Being able to test out new gear but easily return to a standard build also makes experimentation less disruptive. Of course, many of the items referenced above have to be crafted. In the case of gear, these materials are almost entirely specific monster components (tails, hides, scales, gems, etc.). 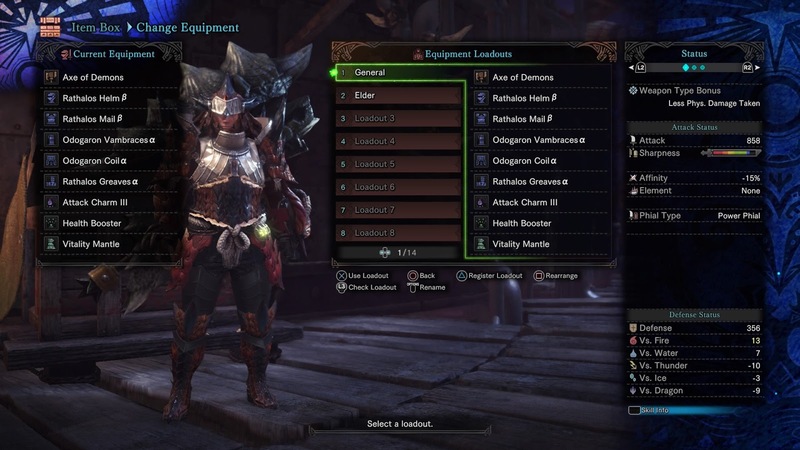 With each monster having many different pieces of varying rarities, keeping track of what you need to craft a set of armor could easily become overwhelming. 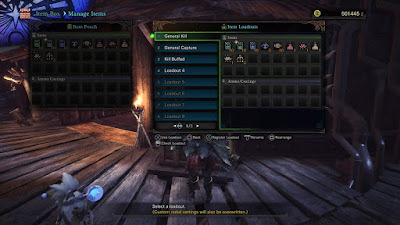 Below is an example of Monster Hunter: World's wishlist system which helps to manage item acquisition. In the field, you get notifications when finding any of the materials still needed for wishlisted items. You even get a reminder notification upon returning to town when you have the necessary items. There are only six wishlist slots available, and I do wish that amount was slightly higher (8-10? ), but six is probably enough for many players. Finally, Monster Hunter: World has some great features unlocked throughout the story that offer alternate methods of gathering items. You can plant, fertilize, and harvest plants, fungi, and bugs. You can send allies out to find items. A trader occasionally stops by offering packages of items. You can convert unused items into certain other items, or trade prints from special limited bounties or events for rare items. Although I do love hunting monsters, sometimes there is just that one item I need that eludes me. It is great to have another possibility for finding that item so I can focus on other aspects of the game in the meantime. For example, I often use the garden to keep up supplies of honey (for mega potions) and flash bugs (for flash pods), two items which I almost always bring with me. All of these item management features serve to keep my attention where it belongs: monster hunting. Reducing the friction of menu navigation let me spend most of my time engaging with the rewarding combat and exploration. I would love to see more games with deep item systems implement similarly helpful "quality-of-life" features. Day 1 of the Path of Exile Bestiary league was a mixed bag for me. I reached level 52 with my Inquisitor using Molten Strike with Ancestral Call. I am mostly following this Ele Claw Inquisitor guide by GornoDD (video at bottom). I have had pretty poor luck with leveling drops so far, but I used the new beastcrafting system to create some helpful items like a triple resistance helm, a unique belt (ended up with The Magnate), and some helpful flasks. I tried to craft a few claws, but they all turned out poorly. Unfortunately, on launch, the beast capture mechanic in Bestiary league was an exercise in frustration. The Bestiary UI wasn't working for about 45 minutes at the beginning of the league, which left a few of the leveling recipes skipped over. The net throwing is clunky, managing nets is tedious, new recipes block a large portion of the screen, targeting rare beasts in the middle of player skills and enemy skills and enemy summons is difficult, and the enrage mechanic, where beasts break out of nets (and heal), is poorly implemented and poorly explained. Luckily, and impressively, Grinding Gear Games has already started to fix some of these issues the community has brought up. In a thread titled "Bestiary Improvements So Far," GGG lists changes to the recipe UI (including a way to turn off the notifications altogether) and improvements to how rare beasts are captured. Only two hours later, another thread detailed additional changes (coming later), adding a three-second capture window and new nets which can capture dead beasts. I still think more work needs to be done on the visibility of traps and/or rare beasts. We already went through this with Abyss, where the visibility was improved over time. I am very glad that GGG is quickly moving to address the other issues, though. With some past leagues, like Harbinger, league mechanics sometimes went weeks before some problems with them were addressed. I am looking forward to playing with a better Bestiary system, seeing how the mechanic works at the endgame and fighting all the new bosses (including Uber Elder/Shaper). I played a lot of great games in 2017. Here are 10 of my favorite games of the last year, plus some honorable mentions at the end. Persona 5 took me completely by surprise. I had never played any of the earlier games in the series. I always had an interest in playing them, but never really got around to it. I was wary of the time-limited mechanics as I usually don't enjoy those pressures, but with Persona 5 I finally dove in. I am very happy that I did. I was enthralled for nearly 100 hours. The evolving story and intriguing cast paired with enjoyable combat, dungeon crawling, and other activities meant there was never a dull moment. I even had fun managing my limited time, choosing which activities to pursue or relationships to grow. The uniquely styled art consistently impressed me, even down to the menus. The soundtrack is a wonderful mix: peaceful, frenetic, relaxing, tense, upbeat, sad, and always unique. I even love the battle track's use of vocals which would normally bother me. When I reached the end of Persona 5, I wasn't ready. I had finished most (but not all) of what the game had to offer, and I still wanted more. I'm sure I will start another playthrough eventually, but for now, I am happy with one satisfying, memorable experience. Maybe I will try to play some of the older entries in the series first. I played and enjoyed Divinity: Original Sin a lot when it was released, then again with the Enhanced Edition. I played both alone and in a co-op game, both of which were great fun and very different experiences. I don't think it is an exaggeration to say that Divinity: Original Sin 2 improves almost everything from the first game. The writing is better, the characters are better, the progression is better, the choices and consequences are more impactful, the world is more reactive, and even more freedom is offered. 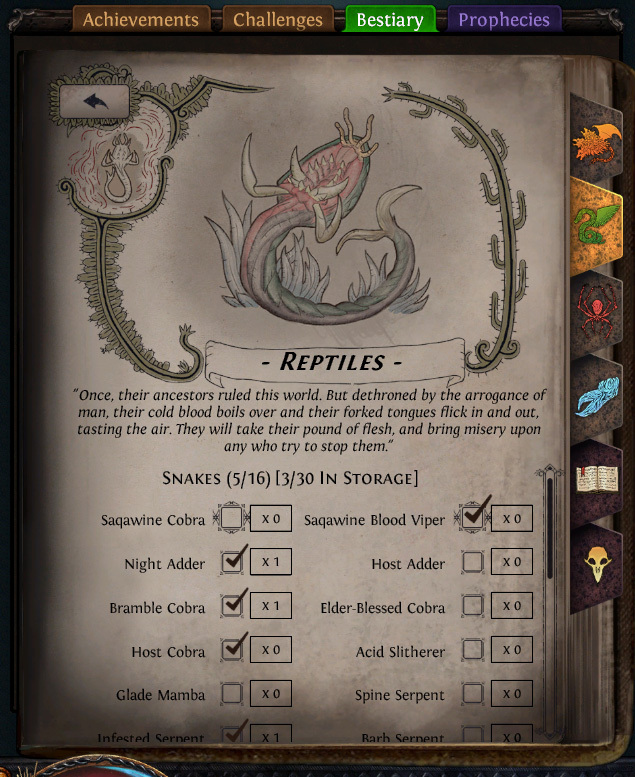 In Original Sin 2, you can accomplish goals in almost any way you can think of. Many quests can be solved by combat, or stealth, or diplomacy, or manipulation, or magic, or trickery. Quests can be failed by your actions, NPCs change their opinions of your party members, and those party members can even insert themselves into conversations, forcing hard decisions. The premade "Origin" characters were a great addition, each with their own backgrounds, storylines, unique abilities, and personalities. I chose former Lone Wolf assassin Ifan Ben-Mezd, along with arrogant lizard The Red Prince, exiled dwarf pirate Beast, and undead Fane searching for others of his race. Each of these characters has specific motivations, individual quests, and potentially major effects on the story. The unique tactical combat is improved as well, with a new armor system that I initially disliked but grew to really appreciate. Tying most crowd-control effects to physical or magic armor and making them guaranteed once that armor is removed solves the "randomness" that could sometimes ruin battles in the first game. Instead of fishing for stuns on round 1 and hoping the enemy doesn't succeed in doing the same, you can plan around consistent effects. The capped action points (sorry, Glass Cannon) made each skill feel more meaningful instead of just spamming out as many skills as possible each round. 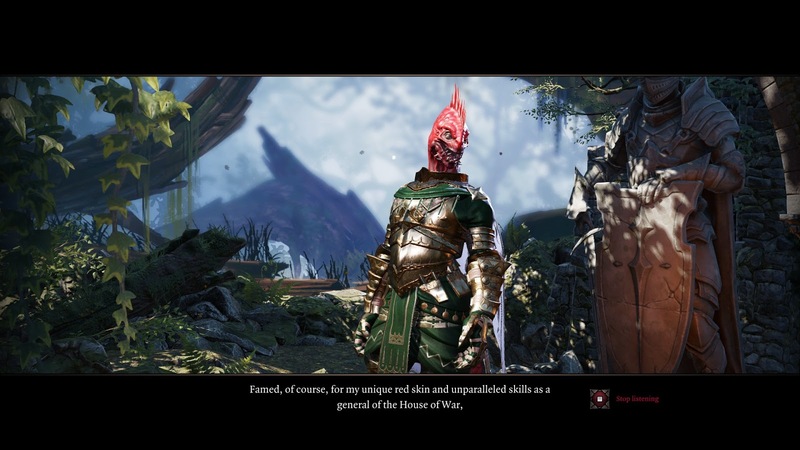 I was completely engrossed for my entire solo playthrough of Original Sin 2. I actually had to consciously stop myself from immediately starting a second playthrough when I was finished. I had other games to try, and I also wanted to save my second playthrough for when I could play the game in co-op. I can't wait to experience the game again in a different way. I do not own a Wii U or a Switch, but I actually borrowed a friend's Wii U to play Breath of the Wild (and also Tokyo Mirage Sessions after enjoying Persona 5). I don't think I played anything else for days and days. Breath of the Wild showed just how interesting an open world game can be. All around you can find natural puzzles, shrines, NPCs, and other points of interest. Almost everything in the world is interactive. You can roll boulders down hills towards enemies, chop down trees to create bridges, spark spreading fires, use metal objects as lightning rods, and probably whatever else you can think of. Link can climb almost anything and use his paraglider to get around. The game even goes so far as to make climbing more difficult in the rain, which is frustrating, but a nice touch. Add in the magical runes for bombs, magnesis, stasis, and cryonis and you can do all sorts of crazy things. The combat itself can be a bit dull, but all these interactive elements carry the gameplay. Weapons frequently degrade and break, especially early on, encouraging the use of these alternate combat methods. In many cases, you can even just avoid combat altogether, except for one disappointing forced stealth segment. The story is similarly average, but some of the support characters are entertaining. I will say the worst aspect of the game is by far the terrible inventory management. I was constantly trying to pick up items, realizing my inventory was full, opening the inventory, dropping an item, closing the inventory, and trying to pick up an item again. On the other hand, I absolutely loved the in-game compendium which catalogs items and creatures once you have taken a photo (and then uses your photo as the image). I spent a lot of time tracking down new entries for the compendium and trying to grab good photos to make my compendium my own. Horizon: Zero Dawn was another surprise for me, though in a different way. I was confident that I would enjoy an open-world robot dinosaur hunting game. The trailers showed off some unique combat and imaginative art and world design. But I did not expect such a well-designed story with fleshed out villains and heroes and mysteries. I was more invested in characters who I only experienced through audiologs and written logs than I was in any character in other, similar open world games. The conflict between Ted and Elizabet, the motivations driving Sylens, Aloy's past (and her father's past), and the discovery of just what exactly happened to the world drove me through the main plot with a sense of urgency I rarely have in these games. Similarly, I never grew bored of the combat loop. Even after gaining access to the majority of weapons and encountering the majority of enemies, I never felt the combat growing stale. The combination of unique weapons & tools with the physicality of the dinosaurs made every fight feel new. Whether I was tearing off armor pieces with a bow, setting up traps and tripwires, or diving into melee with a spear, the enemy reactions felt individual. The only complaint I had about Horizon was the constricting inventory, constantly overflowing with all manner of dinosaur parts, plants, and materials. The arbitrary space limit was too high to feel realistic but also too low to feel good in a game of hunting, salvaging, and gathering. NieR: Automata is hard to describe. It's a strange mashup of genres, perspectives, and styles. You even have to play the game multiple times to experience the full ending(s). The beginning drags a little, the second playthrough is almost identical to the first (but much faster), and yet I kept going. I was rewarded with deep, dark, complex stories hiding beneath the initial presentation. 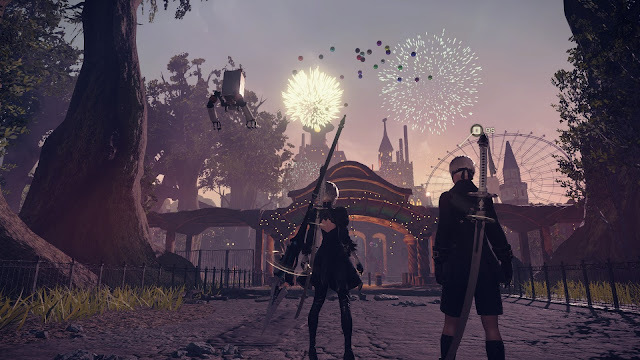 With developer Platinum Games, Automata has the expected flashy, fast-paced, combo-based combat. For me, the combat was just good enough, but a bit tedious or even too easy at times, with infinite, near-instant dodges. An interesting chip system allows great customization that actually fits within the story of the game, and those were what made the combat more fun for me. You can even remove your OS chip for an amusing result. Other chips include stat boots, automatic item use, HUD elements, lifesteal, and more. On the Easy difficulty, you can add chips to automate attacking, dodging, etc. Much of the lore and background information is hidden in logs, character conversations, sidequests, or even unlockable "weapon stories" (from upgrading weapons). It can be easy to miss a lot of what the game has to offer; some of the best work in the game is in the optional content. I was rewarded for exploring with not just physical rewards, but a better understanding of the world of NieR: Automata. 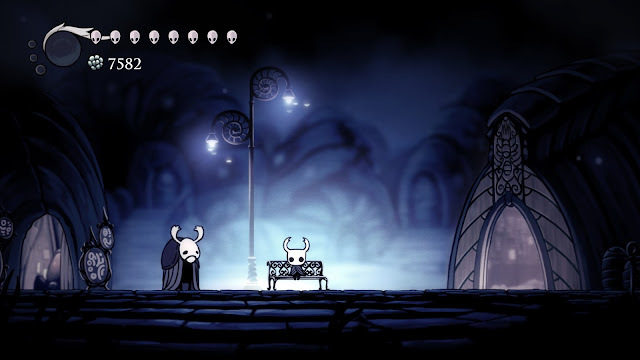 Hollow Knight came out of nowhere for me. I was unaware of the game entirely before its release, somehow missing its Kickstarter campaign. I believe I first saw Hollow Knight being streamed and it caught my eye, so I decided to give it a try. I ended up being blown away by what a great "metroidvania" game I had almost missed. The world of Hollow Knight is exceptionally well-crafted, full of secrets, hidden passages, collectible items, characters, and sequence breaks to discover. I have seen the setting compared to Dark Souls, and I would have to agree. There is a sense of mystery around everything; NPCs offer vague hints about the lore, there is an abundance of environmental storytelling, and there are similar themes around the decaying world and its inhabitants. The hand-drawn art and atmospheric music create a great environment to explore. Hollow Knight doesn't bring too much new to the table in terms of combat and platforming, but all the traditional elements have been brought together very well. Traditional upgrades like wall climbing, air dashing, and double jumping are used to great effect in both combat and exploration. An extensive system of runes can be found and used to alter your playstyle, offering bonuses that vary from simple stat boosts to entirely changed abilities. A great mix of difficult bosses, platforming challenges, and relentless enemies kept me on my toes throughout the whole game. I have not finished Cuphead yet. I'm not even that far in (early in "world 2"). I can already tell I will be returning to Cuphead again and again until I complete it. The artwork is extremely well-drawn, the character animations are charming (even the bosses! 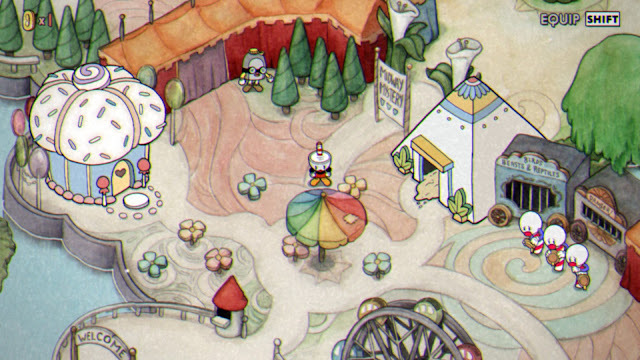 ), and the soundtrack perfectly matches the Cuphead's unique style. I would probably love Cuphead even if the gameplay was average, but I'm finding the game a lot of fun. The bosses are challenging, but fair, with learnable patterns, attacks to parry, and windows to deal damage. None of them (so far) have seemed to drag on too long. Even the "run 'n gun" levels fit into the game well, offering a change of pace that requires a different set of skills. I even liked the occasional flying levels, though probably less than the grounded stages. In combat, there's no MP. Instead, most abilities you have can only be used once until you use a Defend/Recharge move to restore everything. As you choose abilities, your character's style score goes up and as that goes up, your abilities become more effective. There are also a few "Burst" abilities that you can use that will spend all of your existing style points for one massive effect. Every few turns, your characters will go into Hyper mode and abilities will deal double damage and ailments are more likely to work. Plan in advance to take advantage of hyper and style for combat success. This makes many battles, especially bosses, almost like a puzzle. Trying to coordinate style increases, once-per-battle items, buffs/debuffs, and attacks with the periodic Hyper boosts, move recharges, and enemy attacks can get very complicated. A simplistic equipment system offers even more abilities, and for most of the game, your party is constantly being switched around with new characters, necessitating changes in strategy. Thankfully, the game also includes very limited grinding and very few filler battles, making most battles feel important and necessary. 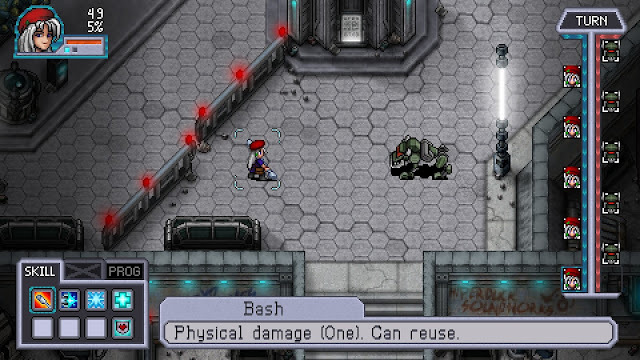 Cosmic Star Heroine would still be fun with a standard battle system, but the innovative combat really raised the game up for me. Not much needs to be said about Getting Over It with Bennett Foddy. Bennett Foddy created QWOP. In Getting Over It, you play as a man in a cauldron who uses his hammer to climb up things. A strange commentary about game development follows your progress. The premise sounds absurd, but the game is surprisingly well crafted. The controls are very precise and every obstacle feels perfectly placed to provide enough frustration to make overcoming that obstacle feel great. On the other hand, you will fall and lose progress, often, again and again. But every time, getting back to where you were is smoother and smoother (until it isn't). I have not finished the game yet (I have gotten slightly beyond "orange hell" at best). I keep coming back, making a little progress, falling, getting back to where I was, making a little more progress, and so on. One day, I will get over it. I am cheating a little here by choosing a game that isn't really from 2017. Warframe is a free-to-play game with a long development history (the fifth anniversary is in March). I had always been vaguely aware of Warframe, but I had never really taken a deeper look. 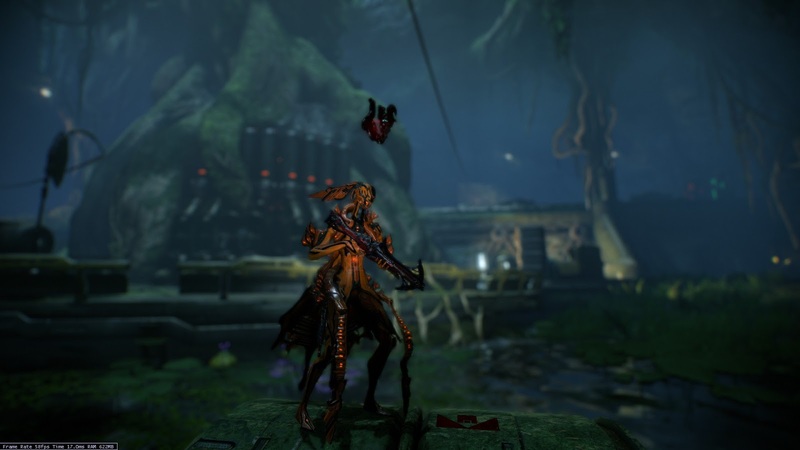 Warframe had a brand new open area with the Plains of Eidolon expansion, and after being disappointed by Destiny 2 and seeing some comparisons favorable to Warframe, I decided to give Warframe a try. I have become a little trapped after finding Warframe to have a dangerous amount of things to collect and experience. There are hundreds of weapons and over 30 warframes to try out (and more always seem to be coming), and all of them can be leveled and customized. Many of the weapons are entirely unique; I have used a rifle that saps my life to create ammo, a sound blaster that sends enemies flying, and a blade that doubles as a shotgun. The warframes are similarly diverse, with frames for damage, support, crowd control, tanking, and more. Octavia is probably the most interesting example I've found, using customizable music which offers bonuses to players who jump, shoot, or crouch in rhythm with the song. All of the weapons, warframes, and companions can be leveled, increasing an account-wide mastery rank which offers its own bonuses. A vast number of mods can be found, upgraded, and equipped to individual items. An expansive codex can be filled out by scanning enemies, resources, and even objects like storage containers and grates. Many enemies and mission types have unique and/or rare drops like crafting blueprints or mods. There are endless resources to be found in different locations. I can play for 10 minutes or 4 hours and never feel like my time is wasted or that I don't have anything to do. I am always gaining something: experience, resources, quest progress, etc. The story does start very slowly, the tutorial is bad, and many of the game's systems are obscure or unexplained. Expect to have the Wiki and other resources open for a long time. I heavily recommend joining a clan in-game, both for assistance and a number of important benefits (and potentially beautiful player-designed clan dojos). Warframe can become quite grindy if you try to craft a large variety of weapons and warframes. But once the systems start to click and you reach some of the later quests (the Second Dream and the War Within are both amazing cinematic experiences), Warframe really shines. I should also mention Warframe's premium currency, platinum, which can be used to buy weapons, warframes, cosmetics, and more. Normally, I would not like a system like that, but Warframe allows players to trade in-game items for platinum. I have not spent any money on the game (yet? ), but have purchased dozens of extra item slots, two warframes (Harrow and Nidus), and some cosmetics. I acquired my platinum solely through trading rare mods and crafting components with other players. In a way, free players can sell their time, the time spent farming or acquiring rare items, to those who buy platinum to skip the wait. It's a very interesting economy. In 2017, Path of Exile saw two major expansions released: The Fall of Oriath and War for the Atlas. I enjoyed the game more than ever with The Fall of Oriath finally eliminating the multiple difficulty playthroughs and adding six new acts to make the game a single ten-act playthrough. Near the end of the year, the War for the Atlas revamped the endgame mapping system with 32 new maps and an ongoing conflict throughout the map atlas between the Shaper and newly-added Elder. My characters progressed further than normal, I completed some endgame challenges for the first time, and really enjoyed the builds I chose to play. I can't wait to see what comes next. 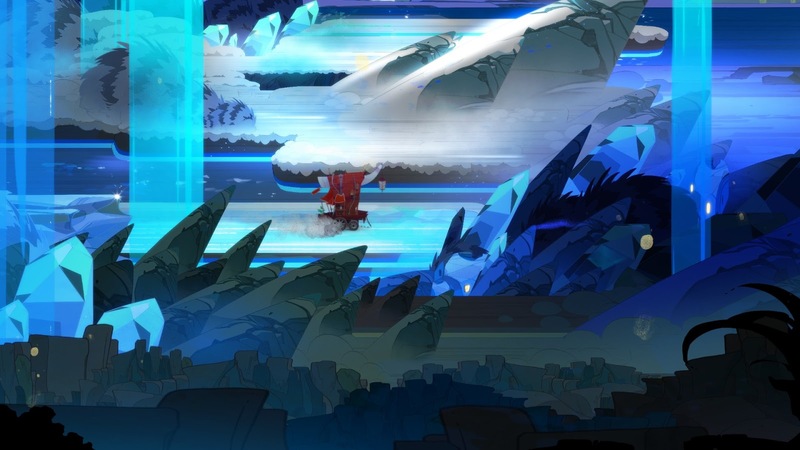 From Supergiant Games, developers of Bastion and Transistor, Pyre continues the trend of unique experiences with great music, narration, and characters. Pyre is only down here because I only just started playing it. I'm already very interested to see it through. From Piranha Bytes, developers of Gothic and Risen, ELEX is another open RPG, though with a heavy "science fantasy" influence this time around. I actually loved ELEX a lot, but it still needs a lot of work. ELEX is buggy, unbalanced, and kind of a mess. The interface is just bad. But beneath the surface there is a great experience. The progression with each of the three factions from hated nobody to barely tolerated outsider to friend to ally feels natural and rewarding. Gaining access to a faction's armor and weapons after numerous intertwined quests was a huge ordeal, but well worth the trouble. Choices you make and characters you deal with have reverberating consequences across the world. I was also surprisingly interested in the story, although its presentation can be very disjointed. I was both disappointed and excited by the ending, which answers a few important questions but leaves many more unanswered, clearly setting up for a sequel. I really liked this prequel to Life is Strange, despite its development by a different team and the switch in voice actors (due to strike). I did enjoy the original game more though. Before the Storm is both shorter and more predictable, but it does have some great characters. I especially loved the quick dungeons & dragons games you can play with some classmates, and the relationship between Chloe and Rachel is explored very well. My first day of the Path of Exile Abyss league (and War for the Atlas expansion) is over. I played for about 6 hours and reached level 48 and act 6. I am playing a Trickster using Essence Drain + Contagion, as well as Blight and Wither (eventually totem) for support. I am also running Blasphemy Despair (later Temporal Chains) and Clarity, plus Flame Dash for gap crossing. I will be using Shield Charge for movement soon, but I haven't switched off my wand yet. I am mostly following Ghazzy's build guide for MoM ED/Contagion Trickster. I have also consulted Dsfarblarwaggle's Essence Drain Trickster league starter guide for some additional ideas and help. I am enjoying the combo of skills so far. Although my current gear has left me a little squishy, the ability to throw out the combo and then focus on avoiding damage (or moving forward) makes the leveling process pretty safe. So far, the Abyss league is a lot of fun. The abysses themselves feel very similar to breach, spawning large amounts of monsters (some very dangerous) but feeling appropriately rewarding for the risk. The new Abyss jewels can have crazy stats like flat damage and life, mana regen while moving, various on-hit or on-kill effects, minion bonuses, and many other mods that cannot normally appear on jewels. These jewels are so powerful that I think the new Stygian Vise belt type that includes an abyssal jewel socket is a no-brainer in most (non-Headhunter?) cases. Being able to roll the standard desired mods on a belt and then add a crazy jewel on top of that is really powerful. There is also a great flexibility in being able to switch out different defensive or offensive jewels as your build evolves. A quick example of Essence Drain + Contagion from my Mayhem race character. 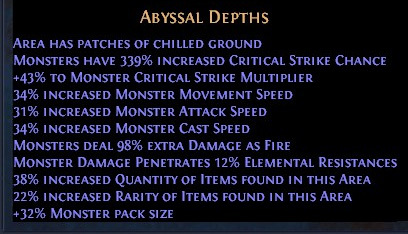 I have been to the "abyssal depths" which spawn at the end of some abysses a few times. The depths are a nice change of pace from the more frantic abyss chasing, and the boss at the end was challenging but not frustrating, despite a time limit. Otherwise, I am enjoying some of the quality of life changes in the patch, especially the improved buff/debuff system. Flasks now show a duration bar, and by default, your flasks no longer clog up the buff bar. Similarly, your own auras do not show an icon by default, which makes sense as they should always be on anyway. Finally, debuffs now show on a separate line, making it much easier to notice dangerous debuffs like curses, shock, bleed, etc. 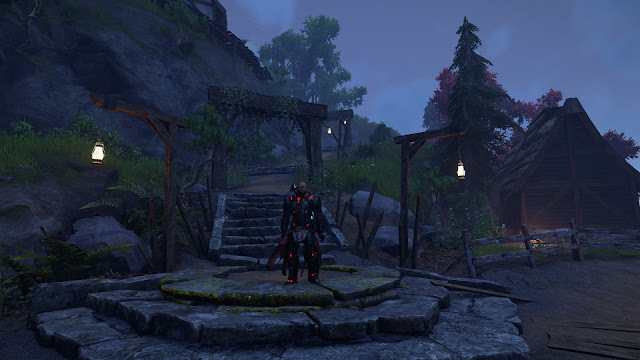 I was also glad to see the new quest reward screen which looks much better than the old repurposed vendor screen where you "bought" your quest reward. These small touches that have been piling up are going a long way towards making Path of Exile look less rough around the edges.